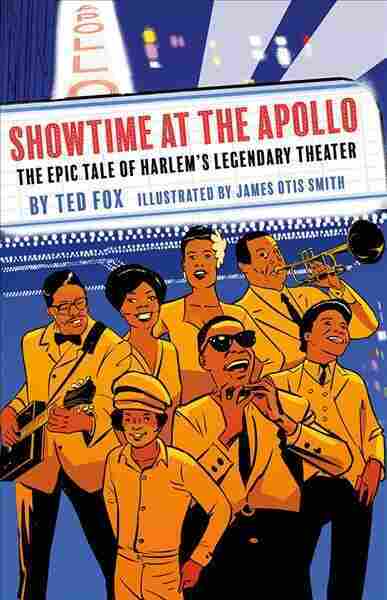 Keeping A Famous Theater's Myth Alive In 'Showtime At the Apollo' This new graphic adaptation of Ted Fox's history of the Apollo Theater captures countless electrifying performances, but goes easy on the grittier aspects of the fabled theater. Thinking about the Apollo Theater, the legendary Harlem institution at the center of Ted Fox and James Otis Smith's new graphic novel, I remembered a plate of stew. It was in Sammy Davis, Jr.'s 1965 autobiography Yes I Can. Davis wrote about an evening in his childhood when, in one of the many diners he visited while traveling the country in his father's vaudeville act, he asked for the nightly special: beef stew. As he dug in, he noticed that his father and their troupe leader hadn't ordered anything. "Our stomachs are a little upset," Davis' father said. "But you clean your plate. You needs food to stick to your ribs in this kind of weather." But he took a tiny piece of his son's roll and, when Davis was finished eating, wiped up every bit of leftover gravy on the plate. The Apollo is a bit like Davis' father — and a bit like the stew, and a bit like Davis himself, all rolled into one. Since the early '30s, the theater has served up a complex blend of reality and illusion to keep people — audience and entertainers alike — going through hard times. Virtually every notable African-American performer has played the Apollo, from Billie Holiday to Bob Marley, James Brown to Jay-Z. The remarkable institution is a microcosm of the world of black popular culture in all its highs and lows, achievements and setbacks — not to mention sustaining myths and necessary lies. It's no wonder, then, that almost everyone among the dozens of sources Fox spoke to expresses an enthusiasm about the Apollo that borders on hysteria. Even the great Davis himself is overcome with excitement when Dionne Warwick calls to tell him about Fox's project: "Whaaat?!" he exclaims, so loud that the phone flies comically into the air. The very next day he's regaling Fox with anecdotes about performing at the Apollo in the '40s. "He tells me how much pride he felt walking to work from his family's nearby apartment, how different it was playing ... a gangster-run joint like the Copacabana versus the Apollo's legendary 'world's toughest audience,'" Fox writes. Davis tells him, "You didn't go into the Copa lightweight — they'd break your legs. But at the Apollo, they'd break your heart." On the other hand, when a show at the Apollo was good, it was transcendent — for those onstage as well as off. "If you're a black entertainer in Charlotte or Mississippi, you have great constraints put upon you," Atlantic Records cofounder Ahmet Ertegun tells Fox. "But coming to Harlem and the Apollo was an expression of the black spirit in America. It was a haven." The voices in this book are almost uniformly boosterish about their theater because it truly feels like their theater, even if it was owned by white guys for much of its history. Fox echoes their enthusiasm, skimming briskly past the bleak parts — from cockroaches in the dressing rooms to riots out in the streets. Smith's art has a similar mythmaking quality — all his depictions of the Apollo's performers are iconic. He draws these entertainers at their best possible moments, just as they'd like to see themselves. Though he captures numerous electrifying onstage scenes, he softens the showbiz lifestyle's gritty side. These are understandable choices, but they result in a book that's too invested in its own myths to be a great read. That may be the only way to write about the Apollo, though. Just like its subject, Showtime at the Apollo is a lot like Davis' plate of stew: Tasting simultaneously of desperation and determination, with a heavy dash of hope. It's shame Fox and Smith couldn't explore this potent mix more thoroughly, instead of leaning so much on the last ingredient. But at the Apollo, hope is always the heart of the dish.